If you were to walk . . . Boston’s Faneuil Hall and Quincy Market 125 years ago, on the afternoon before Thanksgiving, you would encounter a large assortment of the city’s vegetable and meat merchants, selling their wares from the many wagons crowding the scene. Today, although these merchants have long since moved on to other areas of the city, Faneuil Hall and Quincy Market are still a great place for people-watching. Traversing its brick walkways, you’ll see commuters rushing for trains, tourists following the Freedom Trail, shoppers carrying bundles, and even street performers entertaining passersby. But, even amidst so many reminders of present-day Bostonian life, the history of Faneuil Hall and Quincy Market are still very evident. 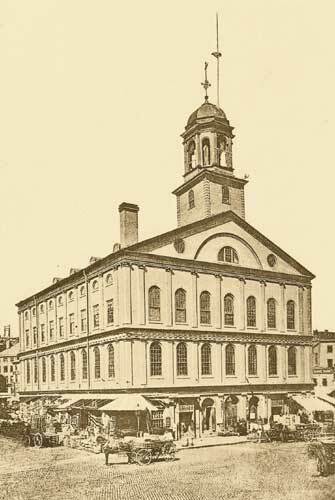 Faneuil Hall, first built in 1742, has served as a marketplace since its beginnings and has witnessed speeches by historical figures such as Samuel Adams and James Otis as well as more recent lawmakers like Sen. Edward M. Kennedy, who declared his candidacy for president there in 1979. 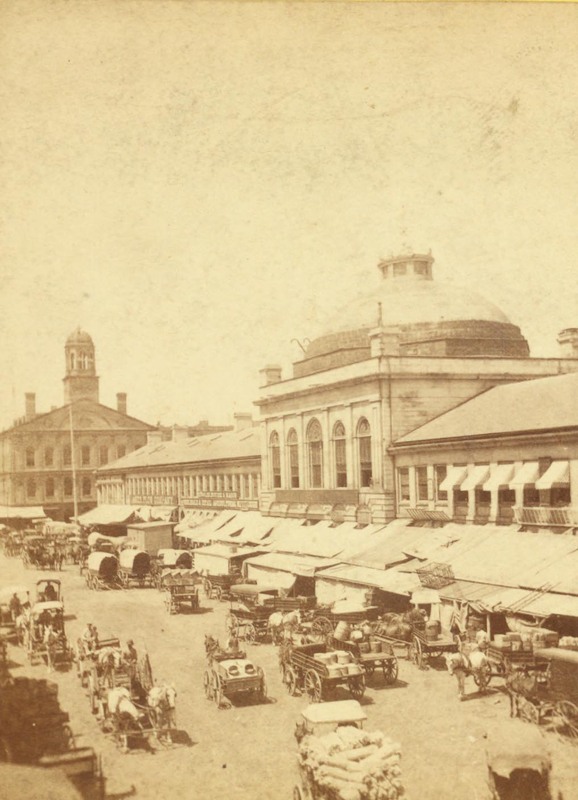 Quincy Market, built a generation later in the mid-1820s, accommodated the growing demand for shop space on what was then Boston’s waterfront, and provided an indoor shopping pavilion for shoppers and merchants seeking staples like eggs, cheese, and produce. Butchers selling meat began coming soon after. Evidence has been found that the butchering occurred on site. The Market Jammed with Thanksgiving Shoppers – Sights Seen and Bits of Curious Conversation Overheard. She had come to the market with her mamma the afternoon before Thanksgiving to buy a turkey, and for the want of anything else to do for a minute jumped upon some scales that stood empty on the sidewalk just back of the Cradle of Liberty. She couldn’t manage the weights very well; but a rosy-cheeked, auburn-whiskered marketman, who doubtless looks as handsome as any in his Sunday clothes, threw himself into the breach. The young woman weighed 132 pounds. But 132 wasn’t bad, for the daughter of the old lady who was buying a turkey, besides being a favorite by her very looks and manner, was short and shapely. She must have been solid, too. There are a hundred funny things at the market the day before Thanksgiving, because the stalls of Faneuil Hall and Quincy market and the narrow alleys between the rough counters improvised in the streets are crowded from early morning till late at night. The dealers are prepared for business. They not only stock the stalls fully, but buy loads of fowl that are brought in from the country and get men to sell them on commission at the stands. Perhaps twenty rows of these extend almost to the south sidewalk of South Market street, and perhaps 200 men, eager for a trade, stand by. A thousand people throng around and purchase, if they can decide to do so. sticking up, like the handle of a parasol, over the opposite shoulder. Here is a fat woman, dressed in a shawl that must have been brought from the old country, looking the counters over again to make sure that she had struck a good bargain; and little Mamie, looking satisfied in spite of the big load of fowl she is carrying, trudges along by her side and tries not to get lost till after Thanksgiving. Here is a policeman, majestic and self-possessed, paying for his dinner like other people out of a very ordinary-looking pocket-book; for why should the spirit of mortal be proud in a crowd like this? Here is a large-eyed, dark-skinned Italian boy ruinously selling thirty-six bundles of matches for twelve cents; at the risk, too, of seeming out of place. Here is a little man selling roasted chestnuts out of measures which have their inside bottoms half way up the sides. Here is a slight, pale-faced dame, in gaudy plush bonnet and ill-fitting threadbare cloak, making her way homeward as well as she can with a live duck under each arm. Here is General Nathaniel Prentiss Banks, inquiring the price of turkeys at a stand where they are thirteen cents a pound, and passing sedately on. A GLOBE young man did not loaf for half an hour in the crowd without catching some curious bits of conversation. “He charged me $1.32,” said the woman not very disgustedly; “but that ain’t much. 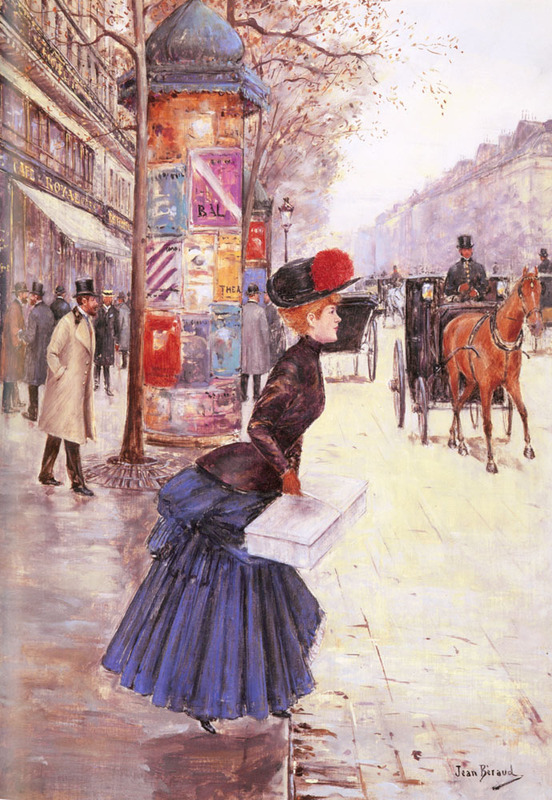 I guess he can have it,” and she took her basket up and went away. “How your daughter has grown,” exclaimed the first as he hurried away. The daughter was indeed a bouncing girl of 8. What a neat post, Ryan. My family lived in Quincy, though I was too young at the time to remember it.